RideApart is like Kelly Blue Book for powersports equipment, providing consumer information on motorcycles, accessories and related services and gear. RideApart launched at the beginning of May and in the past month web traffic has doubled. 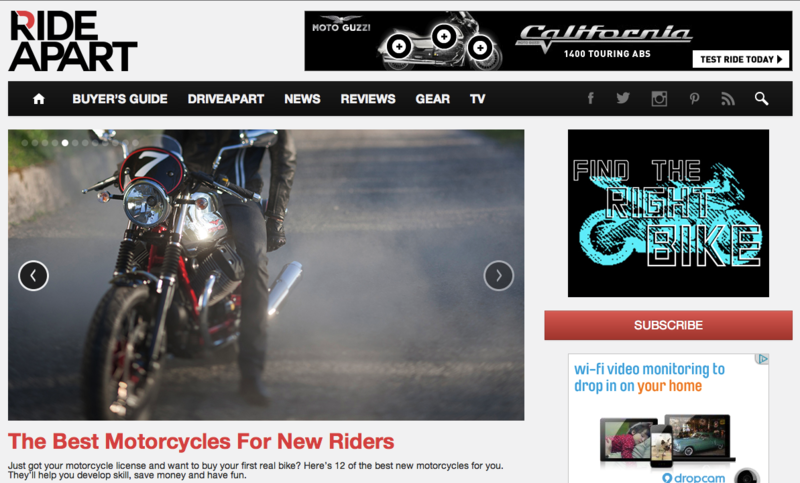 The site also has its own section on the Gawker Media property Jalopnik. Cofounders Jon Alain Guzik and Wes Siler are currently seeking a CTO and Marketing assistant to grow their team of 5. “Grant and I launched HFL back in late 2007 with little more than a gut feeling that motorcycle media needed disruption. Something I think we achieved through creativity, original content, honest journalism and a tireless work ethic. The acquisition, achieved at a time when even mainstream media outlets are struggling, validates that approach. I’ll be carrying HFL forward as RideApart’s Co-Founder and Vice President, Grant’s taking the opportunity to pursue other interests. Is powersports is a $30B/year industry ripe for disruption? RideApart certainly seems to think so.